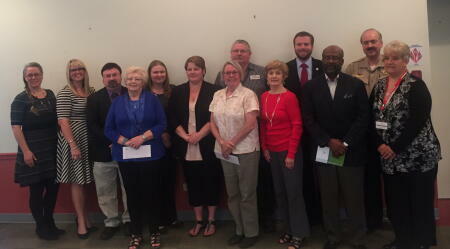 The Montgomery County Fund hosted its annual grants awards ceremony on Thursday, May 19 at First Baptist Church of Troy. The board awarded over $25,000 in grants from the community grant making fund and over $18,000 from the Judy Stevens Endowment, the Brady W. and Joan H. Dickson Endowment and the Branson and Lorraine McRae Endowment. Board President Brady Dickson and Members Sharon Matheny and Earl Leake were present for the award ceremony. Pictured are representatives from grant recipient organizations: American Red Cross, Central NC Council of Boy Scouts of America, Communities in Schools of Montgomery County, Highland Community Center, Montgomery County 4H, Montgomery County Council on Aging, Montgomery County Partnership for Children, Montgomery County Schools, Montgomery County Schools DARE Program and the Humane Society of Montgomery County. Not pictured: Prevent Blindness NC, The LandTrust for Central NC and Trinity Music Academy.